Leigh head of rugby Derek Beaumont says he has been “inspired” by the attitude of coach Paul Rowley and his players in the first weeks of preseason training. Paul Rowley’s new-look squad have been back in full training for a fortnight as they look to achieve their goal of being in Super League in 2017. 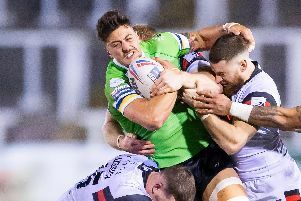 Leigh have been boosted by the arrival of Harrison, Cory Paterson, Reni Matuai and Dayne Weston though have lost several players including Tommy Goulden, Oliver Wilkes, Martin Aspinwall and Kurt Haggerty. Writing in his exclusive Leigh Observer column, Beaumont said that he was excited by what he had seen in preseason training. “There is something special in the air,” he said. “The tone was set at the team meeting, and it was clearly evident that coach Paul Rowley was rejuvenated and explicitly clear in his intentions for the new group that would embark upon the journey of achieving the clear goal I have set for them this year – Super League. “It was always a two-year plan and year one was intended to achieve the platform of additional £350k funding by finishing sixth in the qualifying competition. “Our initial goal was to make the top four in the Championship, which was imperative and was achieved in style by winning the comp by six points, losing only one game. The business plan was to then achieve sixth place in the Super Eights. “Due to a number of factors that didn’t happen but I decided to invest the shortfall myself and keep the train on the track. “We came very close last season and with the large part of the team staying together, combined with the new additions, it could be argued that we should now have the tools to complete the job. “I am, however, aware it isn’t as simple as that and that names don’t win games. So is Paul Rowley and in him I place my trust.